Ellis burst onto the Super Rugby scene during the 2006 season where he ousted Kevin Senio from the Crusaders scrum-half berth. Since then he has established himself as the franchise's number one half-back partner for Dan Carter and has enjoyed much of their recent success in the tournament and also with Canterbury in the ITM Cup. 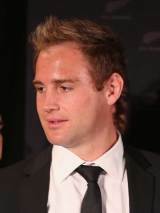 Ellis made his debut for the All Blacks in November 2006 against England at Twickenham and was a surprise call-up to the national side for the 2007 World Cup in place of Piri Weepu. During the campaign he crossed for his first try in their clash with Portugal and enjoyed his first start a fortnight later against Romania. Since then, Ellis has had to vie with Jimmy Cowan and Piri Weepu for the scrum-half berth. In recent times Ellis has had to be content with making an impact from the bench for the All Blacks. However, going into the World Cup - despite Weepu appearing to be favourite for the scrum-half spot - Ellis will hope his franchise form will prove to Graham Henry that he is worthy of consideration for a starting berth. Injuries to New Zealand's front-line fly-halves meant the kicking specialist Weepu was preferred at scrum-half for the latter stages of the World Cup, but Ellis was on the pitch when New Zealand secured the World Cup after replacing his half-back rival early in the final against France.